. Reference and LINKS .
. Rokushoguu 六所宮 Rokusho-Gu .
. Ruriji 瑠璃寺 temples names Ruri-Ji .
. Ryuugaiji 龍蓋寺 Ryugai-Ji "Dragon Lid Temple" .
. Ryuuginji 龍吟寺 Ryugin-Ji - Singing Dragon Temple .
. Ryuugeji 龍華寺 (竜花寺) Ryuge-Ji "Dragon Flower Temple" .
. pokkuri Kannon ぽっくり観音 / ポックリ観音l .
. ranma 欄間 transom .
. reiboku 霊木 divine tree, "tree with a divine soul" . - rei-oku 霊屋, o-tamaya お霊屋 .
. reisai 例祭 annual festival . six religious practice, roku haramitsu .
. Root Shinto - Book by Tresi Nonno . Shinto is basic Japanese religion. Along with Buddhism, Taoism and Confucianism it shapes Japanese spiritual landscape. But Shinto is often represented as a rather primitive heap of eclectic cults. In this book author tries to eliminate late borrowings and analyse basic concepts and show inner logic of Root Shinto (early Shinto). I am Tresi (Tresi is Ainu female name). I am anthropologist from Japan. I have been studying Shintō since 2003, also I am a follower of a tradition. Shintō is first and the basic religion of Japan. Along with Buddhism, Taoism and Confucianism it shapes the spirit landscape of Japanese culture. Shintō is the only religion of Japan which was not imported but is of islands origin. It is important to note that term Shintō would better be revised because it is just an artificial term invented in the period of Nara (more exactly about 720 y.) in order to distinguish believes of islands origin from Buddhism and Taoism: in the scroll of Nihon shoki 日本書記devoted to the emperor of Yōmei 用明can be seen the following “Emperor believed in the doctrine of Buddha and honor the way of kami”. Term Shintō （神道） – “the way of of kami” was invented according to Chinese model of naming of different doctrines: as far as Chinese culture is culture of written signs, doctrines and concepts are expressed in written signs and through these signs can be step by step acquired. Due to this gradually acquire appears the analogy of “way”, i.e. gradually moving to a certain aim but Shintō was not a "way", it was not a systematic doctrine so we should use this term with certain degree of awareness because using it we accept the Chinese point of view. 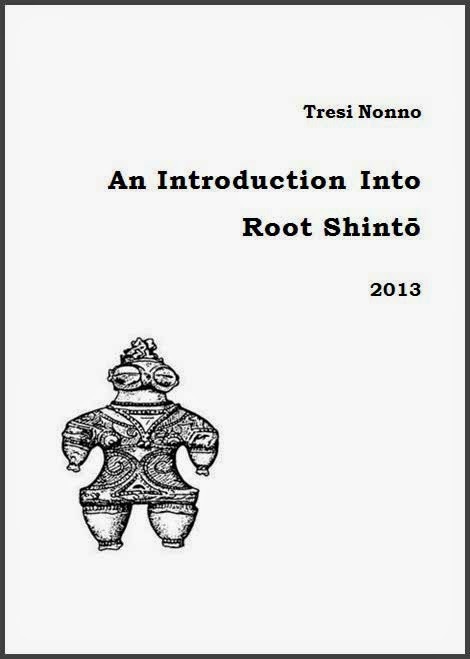 If we are going to catch the essence/inner logic of Shintō we have to find its root/roots and if we r going to find its root we have to pay certain attention to the history of Japanese ethnicity cause Shintō was shaped along with the formation of Japanese ethnicity. Japanese ethnicity is a mix of at least three components: Ainu/Jomon, Austronesian and Korean. The origins of Shinto go back to the very earliest times and it is related rather to the animist religions of the ancient Siberian populations. Shinto gives divine status equally to forces of nature, to animals or to famous people. These divinities are called " kamis " in Japanese and their Chinese equivalent is " shin ". "To" or "do" mean " way " or " method " in Sino-Japanese. So Shinto is literally " the way of the gods ". The most important god is the sun which, among its other virtues, serves as a protection against invasions. So, we can say that the Japanese flag is a Shinto symbol. The very name of the country, Nippon, is written with two Chinese characters : " ni ", meaning " sun " and " pan ", meaning " root " hence the translation "Empire of the Rising Sun". Japan comes from the Chinese pronunciation of the same characters, Je-ben. However, the sun does not have a hierarchical role among the Shinto gods : each one has its place. The kami almost always inspire respectful fear. Among these we find mountains, animals like the tiger, the snake or the wolf ; and the Emperor himself. An imperial minister of the IXth century is the kami of calligraphy. There are allegedly 800 million kamis and the nickname given to Japan is Shinkoku, " country of the gods " .